The time had finally come for the beer ride. It took some time to get a date that suited more than a few persons. This time there were five of us: Me, Matti H, greenman, JJ and HAK. There was in average about 15 cm of snow, but occasionally both a lot more and less. Greenman and I were on Pugsleys, the rest had ordinary 26" bikes. 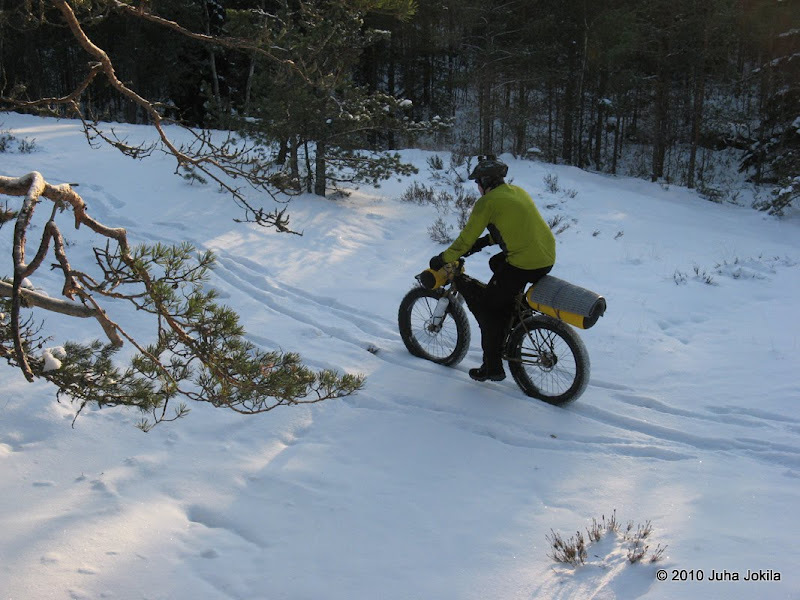 Matti H rode his fully rigid singlespeed Surly 1x1. How do you fit two Pugsleys in a small car? The answer is barely. I want to have as small a car as possible, mostly since I don't care for cars, but sometimes it could be a bit bigger. The start was 45 minutes away by car. The ride started around 19:15 with boardwalks. In practice, only the Pugsleys could ride them. It was very hard to see where the boardwalks were, because of the snow. The temperature was around -12°C (10°F), colder than forecasted. The boardwalks consist of two parallell planks. Often there is room for a tire between the planks, making riding them an exercise requiring precision. To my surprise, even the fat tires sometimes got stuck between the planks. An animal showed the way. Even JJ, who has a very good technique, had to walk. Not even a Pugsley can handle everything. Somebody had actually been here, surprisingly enough. Time to drink beer, make grilled sausages and toast sandwiches and make glorious plans for the future. Laitilan Kukko, the preferred beer at Vajosuo. This is one of the very few Finnish beers that actually is good. My sleeping spot. We went to sleep around three o'clock in the night. To our (quite small) surprise Matti K showed up in the morning around six o'clock and started the fire. He even brought coffee and donuts. That is what I call service. He came by car and then walked the final bit to the lean-to. Thanks a lot! The temperature in the morning was again colder that expected, around -18°C (-0.4F), but it caused no problems for us. Matti H, greenman and Matti K.
My bike is packed again. We left at 9:00 in the morning. Matti H has a very bad moment. Refilling the energy supplies. The riding was again hard and we were getting low on energy. A picture of yours truly taken by JJ. Just a small bit left. JJ seems happy. We were done at 12:25. This was a fantastic outing, and I think this is the best way to do overnighters during the dark time of the year. I will do a post with some equipment ponderings in a few days, but for now I can say that the Pugsley definitely was the right tool for the job. A slide show with more pictures is here. The bike is packed for the beer overnighter. The forecast lowest night temperature is -14°C (7°F). I'm away for a few days at the Pyhäjärvi lake some 60 km from Turku, unfortunately without my bike. Currently it feels like winter. Yesterday it was around -7°C with a strong wind from the north. Today everything looked different. I took a few pictures just before the snow storm started. We got a few cm of snow a few days ago and the ten day weather forecast promises fairly cold weather with day temperatures between -6°C and -13°C and nights that are a few degrees colder. Is it possible that the winter is already coming? I am hopeful, but it would really be quite early. I did go out and ride the Pugsley both yesterday and today. There is still no real benefit to the fat tires in the snow. The grip was good, but narrow tires with large knobs would have cut through the snow and given equally good grip. On the occasional half-frozen mud the fat tires did float well without sinking down. When we get more snow the fat tires should be quite nice to have. Compare this picture with the one from a week ago taken in the same place. A little snow really changes the landscape. It is really hard to take self documenting pictures with the DSLR. Incredibly enough, the self timer still is as primitive as it was on my SLR:s 15-20 years ago: Just the choice between 2 and 10 seconds. Compare that to my compact camera, which offers a delay of 1-30 s and after that 1-10 pictures. Implementing this would not take more that maybe one work month to program and test. I guess Canon wants us to buy a remote release costing almost 200 bucks. Fortunately, there are cheaper third part alternatives and I have one on the way already.